Engineers at the Georgia Institute of Technology have developed a prosthetic vein valve to help improve the lives of those suffering from a condition known as chronic venous insufficiency. The condition, which affects more than seven million people in the United States alone, occurs when valves in a person's veins can no longer ensure a one-way flow of blood back to the heart. "Blood flows to the toes because of gravity, but the body uses vein valves to pump blood in one direction back to the heart," said David Ku, the Lawrence P. Huang Endowed Chair in Engineering and Entrepreneurship and Regents' Professor in the George W. Woodruff School of Mechanical Engineering at Georgia Tech. "However, sometimes a vein valve dissolves away after a blood clot. The loss of the valve leaflets allows blood to flow the wrong way, causing swelling in the legs and ankles." Ku is leading a research team that has developed a prosthetic vein valve to replace damaged, non-functioning valves. The prosthetic vein valve design and results from laboratory studies were presented at the Society for Biomaterials Fall Symposium in Atlanta on September 12. The research – under way for the past five years – is funded by the Wallace H. Coulter Foundation and the National Collegiate Inventors and Innovators Alliance. Ku's collaborators on this project include Rudy Gleason, an assistant professor with joint appointments in the Georgia Tech School of Mechanical Engineering and Department of Biomedical Engineering; Ross Milner, an assistant professor of surgery at Emory University; consultant Harris Bergman, a former Georgia Tech graduate student and now president of Amigent; former Georgia Tech graduate students Rahul Sathe and Laura-Lee Farrell; and current graduate students David Bark and Prem Midha. Individuals with chronic venous insufficiency are commonly prescribed therapies – including anticoagulants, bed rest and compression hosiery – that target their symptoms rather than the cause. Damaged vein valves can sometimes be repaired, but when that isn't possible, some surgical options are available to replace deep venous valves, such as valve transplantation. However, replacing the valve with a prosthetic one is likely the better option because finding a suitable donor valve in one of the patient's legs can be difficult, according to Ku. "Previous studies have shown that even if a donor valve is found, implanting it can cause significant trauma to the patient's leg," explained Ku, who has doctoral degrees in mechanical engineering and medicine. "To avoid these complications, other prosthetic vein valves have been designed, but most have demonstrated poor clinical potential for humans." Ku and his collaborators believe the valve they have developed will overcome previous difficulties. The one-way flap is made of poly(vinyl alcohol) cryogel, a material patented by Georgia Tech in 1999. The material has many useful attributes, including its biocompatibility with body tissue because of its attraction to water; the ability to adjust its mechanical strength; flexibility comparable to that of natural body tissue; and composition of organic polymer, rather than silicone. The researchers will begin conducting preclinical animal trials at Emory University in October to test the in vivo biocompatibility and performance of the prosthetic vein valve prototype in sheep. Sheep were chosen because their cardiovascular geometry and physiology are similar to those of humans. In each animal trial, two prosthetic vein valves will be implanted by Milner. 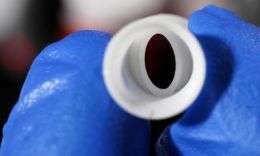 The researchers will test the biocompatibility and performance of the devices for four weeks, using imaging techniques to check that the valves remain in the proper location, are open and allow blood to pass through the vein. The animal trials will be conducted after several years of optimizing the valve design and testing it in the laboratory. When the Georgia Tech researchers started designing the valve, they wanted it to be as similar as possible to normal, anatomic venous valves. They focused on two major design criteria: the valve had to withstand high pressures without leaking and the valve had to open with small pressure gradients, even after 500,000 cycles of opening and closing, which is equivalent to a half year. "It was important for us to test the long-term feasibility of these valves because they're going to be implanted and used for years," explained Ku. "But since test methods have not been well established for evaluating a prosthetic vein valve, we developed our own." Sathe conducted the initial laboratory tests and found that the valve met the mechanical design criteria – it could withstand pressures of more than 500 millimeters of mercury and opened with a pressure gradient of 2.6 millimeters of mercury, which matched physiologic vein valve function. Detailed laboratory testing procedures and results were described in the June 2007 issue of the Journal of Medical Devices. Next, Farrell developed a laboratory method to test whether blood clots would form inside the prosthetic valve. Results showed that the new generation of valves remained open with no clot formation after 120 minutes of blood flow, whereas control valves lined with polyester closed up after approximately six minutes of perfusion and showed blood cells adhering to the valves. The laboratory tests showed that the prosthetic vein valve exhibited low flow resistance, strong competency, fatigue-resistance, low clot formation probability and material flexibility, which allowed the researchers to move forward to the animal studies. The next step after conducting the animal studies will be human clinical trials. The device will require an investigational device exemption from the Food and Drug Administration so that the device can be used in a clinical study to collect safety and effectiveness data. "There are 400,000 patients per year who are just miserable with the complications from this disease and could benefit from these valves, so we'd like to help them as soon as possible," added Ku.